The Customize group of the PowerPoint 2013 Design ribbon tab includes a Slide Size control that lets you change the size of the slide from standard to widescreen. You should use widescreen only if you plan on showing the presentation on a projector that displays in widescreen format. Besides standard and widescreen formats, you can also click the Slide Size button and then choose Customize Slide Size. Doing this brings up the Slide Size dialog box. This dialog box gives you extra control over your presentation’s page setup. Other options on this drop-down list include different screen ratios (suitable for widescreen displays), standard sized paper, and even 35mm slides. A Custom option even lets you set whatever width and height you want for your slides. Width: Lets you set a custom width for your slides. Height: Lets you set a custom height for your slides. Number Slides From: If your slides include numbers, this option lets you set the number for the first slide. The default is 1. Orientation: Lets you set the orientation to portrait (tall and skinny) or landscape (short and fat). You can set the setting separately for your slides, handouts, and notes. 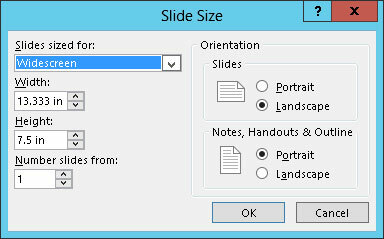 The most common setting is for the slides to use landscape orientation and the notes and handouts to use portrait.